Disruption was the watchword for 2016. The election of Donald Trump could usher in a seismic transformation of the role of government and the social compact that Americans haven’t experienced since FDR was president. Indications are that he will be the most unconventional (and unpredictable) president we’ve had in modern times. His policies, particularly those that relate to peacebuilding themes such as war and peace, humanitarianism, social justice, and human rights, are unknown. His administration could reverse important gains leading to uncertainty, deprivation, and result in conflict and mass resistance. Trump’s advocated positions are in many ways anathema to the work that many of us engage in everyday. We had a violent year domestically, most notably with the Orlando tragedy. We are seeing rising levels of race and ethnic hate and intolerance that remind us of the darkest days of the civil rights era. Many marginalized groups including immigrants, Muslims, refugees, blacks, Latinos, and members of the LGBT community are fearful of the future. As such, those of us working to promote progressive peacebuilding agendas will need to work to find common ground with those of differences, while advocating for ideals and positions that promote human dignity, support the most vulnerable, and advance peaceful outcomes. Libya, Nigeria, and other parts of the world. The next major genocide like catastrophe could be in South Sudan (if it’s not happening already). Having said this, we should be encouraged by the peace agreement in Colombia that brought to an end a 50-year-old civil war. Peace is possible. I was heartened the other day. I was downtown meeting a colleague for lunch, and crossed a street with Madeleine Albright. I asked her for some encouraging words. She said we are a stronger democracy than we think, and that she was hopeful. Professionally, I am thankful for the many colleagues and friends who I have had an opportunity to work with this past year. I’ve visited 17 colleges and universities this past year to work with students and educators, taking me to 11 states and Canada. I have visited community colleges, large national universities, and small liberal arts schools including Soka University of America, an institution founded on Buddhist principles. I’ve also presented at four major conferences in our field: the Association for Conflict Resolution, Peace and Justice Studies Association, Alliance for Peacebuilding, and International Conflict Resolution Education Conference. I’ve also visited peace centers such as the Jeannette Rankin Peace Center in Montana. Peacebuilding practice and awareness continue to expand even in the face of many challenges. Much of my work this past year has been related to my book Peace Jobs: A Student’s Guide to Starting a Career Working for Peace, which was published in the spring. Promoting career paths for young people (as well as those who are older) has increasingly become important to me. I am grateful to those who have purchased my book and are using it. My professional work has now expanded to career coaching those interested in working in the field. This past year saw the first offering of the Atlantic Promise field exercise hosted by the recently established Forage Center for Peacebuilding and Humanitarian Education, Inc. of which I serve as president. The Forage Center recently held a strategic planning retreat to consider ways in which we can expand our offerings in experientially based peacebuilding and humanitarian training. I am grateful to my Forage Center colleagues for trusting me with the leadership of our not for profit to carry on the work of our colleague Paul Forage who passed away in 2015. We will offer the Atlantic Promise exercise again in March 2017. This past year I had the honor of teaching graduate students at the School for Conflict Analysis and Resolution at George Mason University. My first love is teaching and I continue to be stimulated by the classroom environment, and learning from students who bring an array of backgrounds, histories, cultures, and points of view into the classroom. Personally, this has been a year of change (but not disruption!) for my family, and 2017 will bring more change. 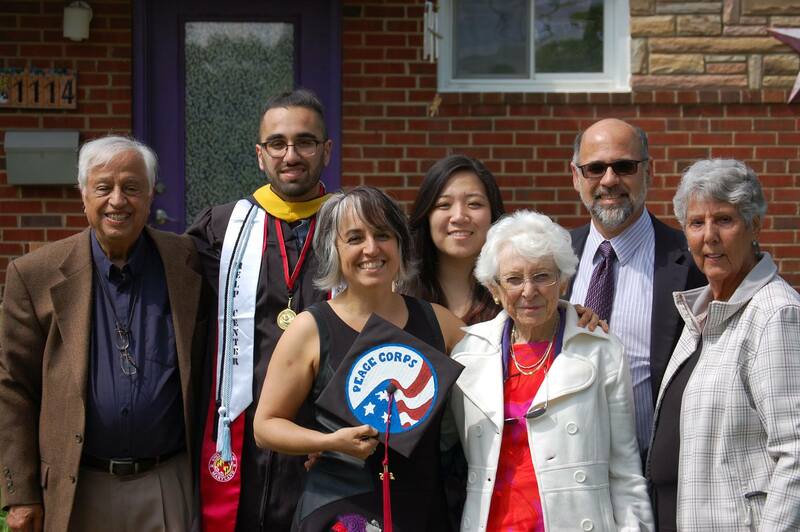 Our son Lorenzo graduated from the University of Maryland in June, and in August began his service in the Peace Corps. He is teaching in northern Namibia. We miss him dearly, but our very proud of his commitment to service and building a better world. We plan on visiting him this coming summer. My wife Lena joined the faculty of Montgomery College teaching nursing, after teaching at Anne Arundel Community College for several years. She is now closer to home (which helps with the commute) and working in a culturally diverse environment. And our daughter Sonya, a high school senior, just finished up submitting applications for college. So in 2017, she will be off to college. We will then have both children on their own, a change for my wife and me, who have strongly parented with an attachment philosophy. We have much to be proud about with our children who are mature, self-confident, and empathic young people. I look forward to continuing to work with colleagues and friends – including new ones – who are committed to advancing peace in the U.S. and around the world. We have much work to do, but I feel there is much to motivate us to collaborate on important causes in a time when there is much uncertainty. Have a restful and enjoyable holiday season. Peace on earth. Hi David! I appreciate hearing what you’ve been up to last year and the ways in which you’ve sowed seeds of peace. Thanks for the work you do to encourage and teach people who are committed to peaceful resolutions. Your focus on intentionally choosing hope during such uncertain times is a welcome reminder. Despite the intense challenges confronting humanity, we in the field have learned that conflict affords the opportunity for growth. May there be plenty of that in 2017 and beyond. Enjoy your holidays! Thank you for your greatthoughts and hard work to spread peace and respect for the world. As you mentioned on your reflrction, we need sastainable peace and economic development more than any time. In 2016, we have seen so many distruction and an unusual things.Meantime our world exprienced some hope. For the upcoming New Year, to ensure peace and to keep our future generation, we have one option: resist together for change.